The Harta tumulus provides another instance of vandalism ruining Lydian waIl painting. The tomb chamber was decorated by paint in an architectural manner and also with representational scenes including human figures. The looted, cut-out pieces of wall blocks with designs call for brief comments here. 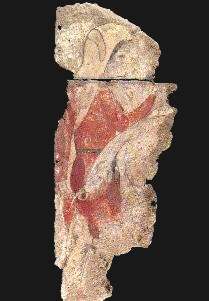 All the figures preserved in the Harta wall paintings are in the category of servants approaching the tomb or kline with alipropriate tasks or gifts. It is important to note that among the Harta figures moving in the same direction, hence on the left side of the tomb facing the kline, there is a distinction in costume, more or less Greek in the case of the first two fragments, Persian in the third case. the attendant apparently followilig a horse. 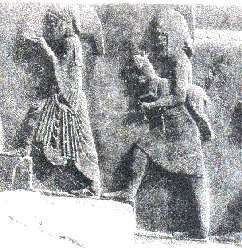 This figure is familiar from the repertoire of the Karaburun tomb near Elmali, which has a number of senvants in the left Wall scene of the tomb owner's voyage accompanied by servants, horses and chariots. Persian costume was adopted for servants of persons in hierarchy of satrapal rule, although all of these may have been native Anatolians (Lydians, even in the region of Harta). Procession of servants from the place of Darios I at Susa, 522-486 BC. The Harta tomb, badly damaged though it is, gives strong evidence of the geographical distribution of tomb chambers with elaborate use of wall paintings as images expressing the continuing lifestyle and status of the buried person in the period of c. 500 BC, in this case Lydian-Persian on the borders of Lydia, Mysia and Phrygia. and without any evidence of writing to determine the linguistic context of the person honoured. Strong affinities in iconography link the lydian-Persian wall paintings to the funeral reliefs from Daskyleion on the south shore of Lake Manyas, the seat of the second major satrapy in western Anatolia, notv being excavated by Tomris Bakir. The tumuli of Daskyleion are on the program of excavations and will be the most promising potential sites of new revelations of Anatolian tomb paintings in the Persian period.